See what Christmas looks like in Mexico City, Mexcio with this drone video! Award-winning cinematographer PostandFly flew the DJI Mavic 2 Pro through the city's historic downtown. Hyper-lapses, panning shots, and sweeping reveals make this holiday video one to remember. Description: An award winning aerial photographer captured the splendor of Mexico City decked out for Christmas. 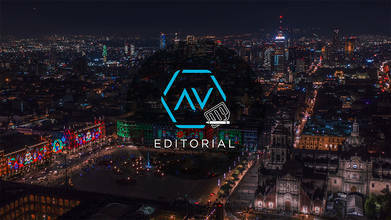 Tarsicio Sañudo, who has traveled the length and width of his native Mexico creating drone videos of dozens of cities, towns, and other landmarks, put his DJI Mavic 2 drone over the country’s largest city during the height of the Holiday season. His video captures some of the most well known sights of the 500 year old city, including the Monument to the Revolution and the roundabout surrounding the Angel of Independence. The highlight of the video is the Christmas-adorned Zócalo main square, next to which is a giant seasonal skating rink which is now a Christmas tradition in Mexico City. Sañudo has won numerous awards for his aerial videos of Mexico, including one of the first AirVuz Drone Video of the Week Awards in early 2018 for his compilation video Mexico: A Trip of 5 Years. He was profiled in a segment of The Drone Dish, an AirVuz Original series in which top aerial videographers discuss their trade.